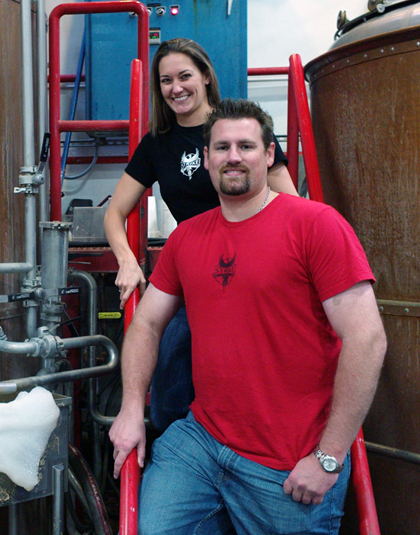 Co-founders of Strike Brewing Co.
Jenny Lewis and Drew Ehrlich of Strike Brewing Co.
All About Beer: How did you first get into brewing? Jenny Lewis: I picked up a homebrew kit a few months after college from a great store, MoreBeer, just down the street. I was 21 at the time. I tried it a few times but it was always just something fun to talk about. When I met Ben, who is now my husband, he swore he would only drink Coors Light. I was determined to change that. Even though he didn’t have an interest in homebrewing, his best friend, Drew (now Strike’s brewmaster), did. From there things just got crazy; brewing, bottling and trying something new every Friday night rather than going out. We decided to make a go of it around the holidays in 2008. So I quit my full time job with a start-up in the Bay Area, returned to Rice University in Houston, Texas, for an MBA, spending much of those two full years studying the beer industry and working on our business plan. What was the first beer you ever brewed and where did you do it? Lewis: I think it was a pale ale from one of those pre-made packages. I can’t even remember if it was any good, but I remember it was fun to make something that was actually drinkable. Drew Ehrlich: I think the first beer we ever made (together) was an American Amber that we brewed in Jenny’s kitchen. What’s your favorite beer style? Lewis: That is the toughest question we get asked at festivals. I usually say that it’s the one coming out of the tap handle in my hand. Ehrlich: Besides the one I have in my hand? It is hard to say which style I like the best because it is really dependent on the mood I’m in, what I’m doing and what my surroundings are like. I’m a huge fan of the taste of hops, so IPAs are always a great choice. But if there is a great or new sour for me to try, I tend to pick those first. Do you have a mentor in the brewing world? Lewis: I spent quite a bit of time talking to Brock Wagner of Saint Arnold Brewing Co. in Houston, and picking his brain about the business side of things. His story has definitely been influential in the way we’re setting up Strike. And back here in the Bay Area, Pete Slosberg has always been willing to lend advice to the new kids on the block. Ehrlich: Steve Donahue, formerly of Firehouse Brewery and now with Hermitage Brewing Co., has been instrumental in my growth as a brewer and taught me many, many things about the art and world of commercial brewing. What inspires you when you’re brewing? Ehrlich: The chance to use my creativity. Brewing beer gives you a nearly infinite number of possibilities of new things to try, and the constant tinkering, tweaking and fresh new ideas to try make it an extremely enjoyable experience. Lewis: Since I’m not a brewer, I’ll use this question instead about inspiration while doing the other tasks that support the brewing. Being such a new company, in the South Bay and Northern California, there is a huge potential for craft beer to grow and prosper. Every time we get a new account, or get a new restaurant interested in carrying craft beer, I still get ecstatic. It really is growing the industry and our brand by touching one person at a time. I love helping to educate people on everything that craft beer has to offer and believing that there is nowhere to go but up keeps me at it every day. Lewis: Strike came to the starting line with a definite business plan. Then we really came charging out of the gate focused upon a target niche. Strike has a consistent and focused purpose in being associated with the active lifestyle in the Bay Area. There are just so many activities here. Strike’s three founders come from an athletic background. So it makes sense for us to market to this group because we’re a part of it anyway. Launching with four session beers is just one way we’re doing this. Plus, offering beer styles attractive to women as well is something we are striving for. Women are a rapidly growing demographic in the craft beer scene and being a woman, I definitely will assure Strike’s efforts appeal to that population. Ehrlich: We strive very hard to make highly drinkable beers and many of our customers respond favorably to that. There are a lot of absolutely great craft beers out there that are huge and wacky, and I know that we will get around to producing some of those. But we the founders, having started out as just a group of friends to who like to hang out for long periods of time and drink beer, wanted to share that experience with our customers and provide them with very flavorful beers that they can have more than one of in one sitting. What do you think drives the popularity of craft beer? Lewis: Accessibility and variety. Most people in the U.S. now live within a few miles of a local brewpub or brewery. Brewers are always trying new things, doing seasonal beers, and changing things up. While it’s fun to watch, it’s even more enjoyable to drink what they come up with. Ehrlich: Diversity. It is becoming much harder these days for someone to say they don’t like beer. Previously there had been only about three or four mass-produced beers that all tasted the same, and from those, people figured that they just didn’t like beer. Now, with the amazing selection of a large number of hugely different styles, chances are pretty good that you can find a beer or style that can suit just about anyone. Also, the public is becoming much more demanding of their beer and that it be tasty and flavorful. This pushes them into the realm of craft beer where they can experience new and exciting flavors. These flavors also make craft beer the perfect accompaniment with nearly any food. Previously wine was the go-to drink to selectively pair with food. Craft beer is now proving that when it comes to pairing with food, its huge range of flavors opens up a much wider range of possibilities of which wine could ever dream. In general, how do you think the next generation of brewers will shake up the craft beer world? Lewis: Both the business aspect and the creativity side are only going to get more exciting. The craft beer trend is booming and I think there’s still plenty more room for growth. Beers will get even more interesting (one-off batches to barrel aging to new ingredients). The marketing and people behind the brands are going to step it up a notch as well. Ehrlich: I think the next generation of brewers are going to continue to build on the great styles and traditions that have been refined for the past 4,000 years, but they will also add their signatures to that history by introducing flavors and techniques never before thought of to combine with beer. For example, fun flavors that include bacon, a hibiscus IPA and even a stout that tastes just like a s’more. And I have no doubt that there will be further advancements in techniques such as barrel aging, using things other than traditional brewers’ yeast such as Brettanomyces, Pediococcus and Lactobacillus. And in terms of packaging, I think there will be some great innovations in the near future with craft beer canning leading the charge. In particular, how will you contribute to that shake up? Lewis: For starters we took a risk by launching with four session beers, and we’re dedicated to always having a few available in our lineup. Utilizing the years of planning that went into this company, we are also really attacking a target niche as I mentioned before. Although we don’t have the marketing dollars that some of the big companies have to put commercials on prime time, we can have a really well executed, hands on approach to our audience while we build that message person by person. Ehrlich: We definitely have plans to barrel age and sour some of our beers, put our beers in cans, and introduce flavors not typically found in beer. Last one: Cascadian Dark Ale or Black IPA? Ehrlich: I’d probably have to go with Cascadian, but only due to the fact that having something that is black and pale contradicts itself. In honor of our 30 Under 30 list, we’re giving away free issues of All About Beer Magazine. Learn how to get your free issue.